While last month I did say that my gardening season had come to an end, I actually still have three cherry tomato plants growing and one of them is managing to produce a dozen or so fruit. Of course, I failed to label the containers so I’m not sure which variety is doing relatively well! What I found fascinating and beautiful was the way this one leaf had grown around a support wire, as if grabbing onto it. 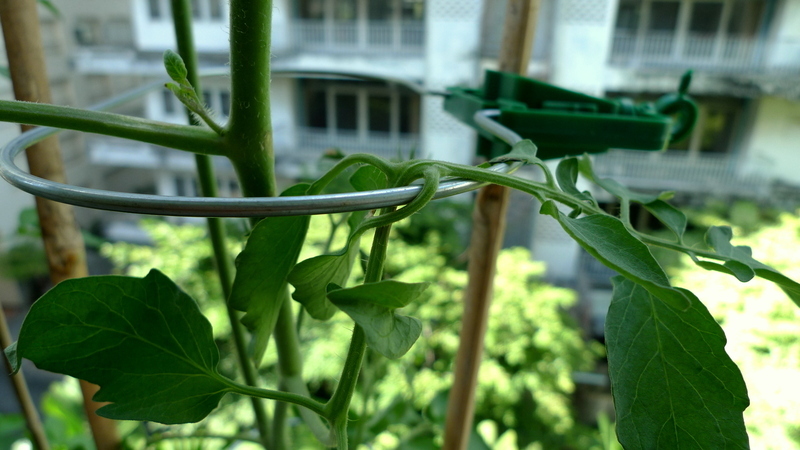 Normally, the branches of the tomato plant just rest on the support cage. This one seemed to be more vine-like, wrapping around. This entry was posted in Uncategorized and tagged garden, gardening, plant, tomato, vine by christao408. Bookmark the permalink. Neat! I’m glad you noticed that. plants do have the tendency to “grap hold” of any supporting structure nearby. maybe it’s just the early stage of growth that allows the plant to do so, considering the growing leaves are still in its stage of development, thus branching out to all directions before the young green stems developed into hard sturdy greyish brown stems that we so often see on adult plants. I am with rudyhou on this one as I can see one of my plants “holding on” as it grows. Your entries about your vegetable garden always bring back memories of my mom’s vegetable garden. I can almost smell the tomato plants from here. You could write a children’s book about it: The Tenacious Tomato Plant. I can picture some cute full-color illustrations. I think if I was looking over the edge of the balcony I’d hang on too! Watching plants grow can be quite interesting. That’s a great picture. You have captured the tendril and the leaf in a most beguiling way.